Call recordings provide many benefits to Funeral Homes and are an essential element of any funeral home answering service. It is important to ensure that your funeral home answering service records calls that they receive for you and that you are taking advantage of all the benefits that service has to offer. Your funeral home answering service should be recording all telephone calls that transpire between them and your families. These recordings should also be made easily accessible to the funeral directors. Online accessibility offers the added bonus of being able to log-in and listen to calls anytime and as many times as you want. This level of accessibility will make your Funeral Homes' relationship with your answering service more transparent. This is important in order for you to ensure that your families are being treated with the level of respect and dignity that your staff practice every day with every family. Ask the answering service about their operator training. How are they trained? How familiar must they be with the funeral home profession before they handle calls? How are they evaluated? At Director On Call for example, all operators receive specialized trainingutilizing some of the key concepts as presented in Alan Wolfelt's 'Handbook for the Funeral Home Staff,' allowing for a seamless transfer of calls and a solid understanding and appreciation of the Funeral Home Profession. We reward our operators performances annually. Director On Call implemented our own In-House Award of Excellence for Call Specialists of the Year. This ensures that we are providing our Funeral Homes with the high quality, professional funeral home answering they expect and deserve. This testing is done on a quarterly basis evaluating every Call Specialist. Call recordings offer an excellent way for any answering service management team to review call operator performances internally. These evaluations will define an answering service's level of performance which will provide you with insight into the level of service your families will receive. Calls should be reviewed internally by your funeral home answering service management team such as a Operations and/or Training Manager on a daily basis to ensure high standards are maintained. This is beneficial towards your funeral homereceiving unparalleled representation on every call. 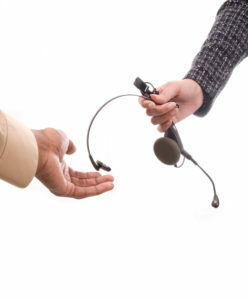 When listening to your answering service's call recordings, your funeral home can evaluate if their service is equal to your quality service standards. Remember: the relationship between your funeral home and answering service is meant to be seamless. Therefore, when a family calls your funeral home and are put through to the answering service, that family will not know the difference between your staff and the operator. If your answering service performs poorly, it will reflect negatively on your funeral home. It's important to have peace-of-mind knowing that families are receiving the level of service your staff would provide them. Call recordings can serve as a back-up to verify any details that may have been missed when a call needs to be referenced. Your funeral home receives all sorts of calls, from calls regarding directions to a service to First Calls. The families that call may be experiencing a significant amount of stress and the information they are sharing is confidential and should be treated in a respectful and dignified manner. Call recordings provide that extra measure needed to protect your funeral home and your families from any discrepancies that may occur during a call. Your funeral home answering service will handle your calls using a customized script developed by you and your funeral home directors. This script will instruct the operators on how to greet the caller, what to ask, how to reply, etc. Call recordings are a helpful way for you to evaluate how effective your scripting is. Listen to a call and make corrections to your script by contacting the answering service.